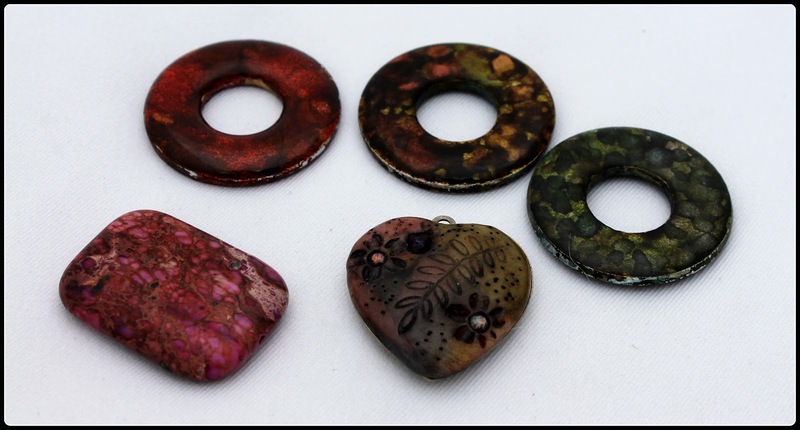 Spice Box Designs: Bead Soup Blog Party Reveal! Now I have to admit that I am not completely happy with this piece. When I signed up for this I did not choose a date so I was assigned the first reveal. I really should not have done that. The anniversary of my daughters birth and death is July 22nd and this year she would have been 6 if she had survived. I know how I get around this time every year and as the date to not only that, but the reveal for this hop got closer, I sunk more and more into a depression. This was such a hard piece for me. I think I played it safe just so that I could get my piece completed on time. Aw Twell, there is always next year, and a lesson well learned about choosing dates. However that being said if I had picked a date the chances of me being paired up with Kim would have been zero to none and that also would have cost me the chance to be able to get to know this wonderful woman. Kim not only sent me beads, but also some finished jewelry made by her and her husband. Oh and one more thing! Not only did Kim send me a wonderful Bead Soup but she also sent me a second helping a week or so later! Told ya I was lucky! I have not had a chance to use it yet however so be sure to check back to see when I do. Check out what else she sent! Thanks Kim! Sweetie, I'm so sorry you had extra pressure on you at such a hard time. You didn't lame out, the necklace is beautiful! And I'm thrilled to come back and see what you make with the rest of your goodies! Marla, you are a trooper in the true sense. Hats off to you again. Brilliant work even in such troubled times. BIG HUGS to you! I LOVE the polyclay pendant in the second set she sent. And that silver pendant, is that part of a spoon?? You did a beautiful job as always, Marla. I know it was a hard time for you, but your necklace is lovely. Wow, wow and wow ... that is gorgeous. How can you say you're not happy with this? you are too hard on yourself! I LOVE this piece - wouldn't change a thing. I commend you and the beautiful necklace that you made in your time of grief. In some way I hope that the beading of the gorgeous rendition of St. Petersburg stitch was therapeutic. You are and awesome person and bead weaver and I am so glad to call you my friend. 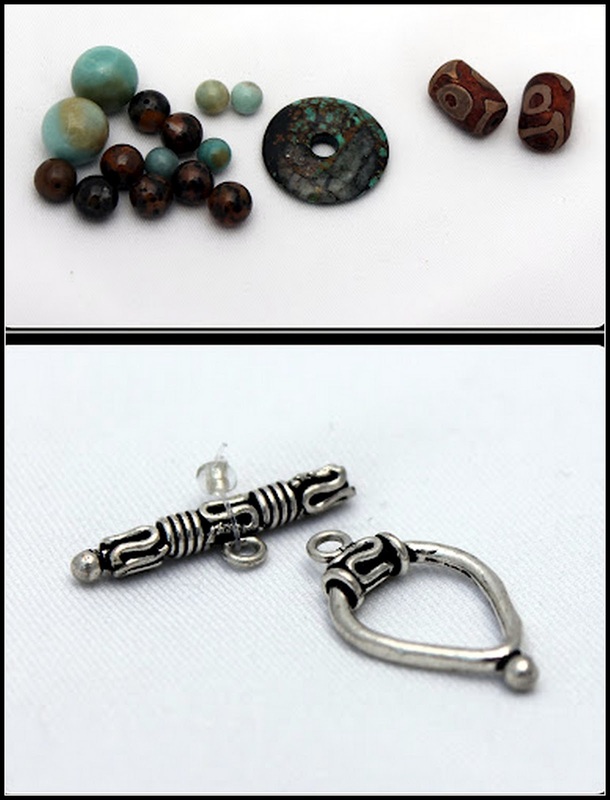 I am so looking forward to seeing what other awesomeness you create with more of your bead soup from the equally awesome Kim! How many times did I say awesome in this post? Humm when one gets stuck on a word it is worth it to be stuck on a good one. Ok now I am just rambling, off I go to another soup. I'm loving the elegant design of your necklace. I'm inspired by your story of how you overcame your very difficult personal circumstances and rose above them. Like Kashmira said: you're a trooper! Marla I think this necklace is lovely, subtle but very striking and a great achievement at such a difficult time. Hope you fee brighter soon. I am truly, truly sorry for your loss...the loss of a child is incomprehensible and I cannot imagine how you feel. So first, I send you a hug and prayers. Second, I do love your pieces here - they are beautiful! Your work is always stunning! Take care! 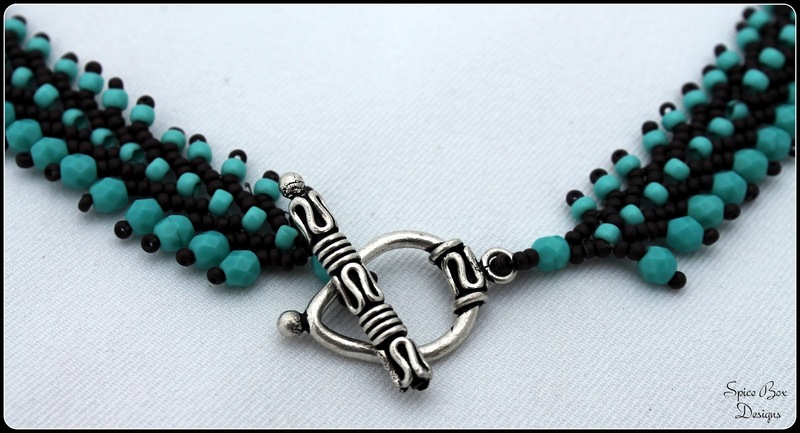 Very beautiful necklace! 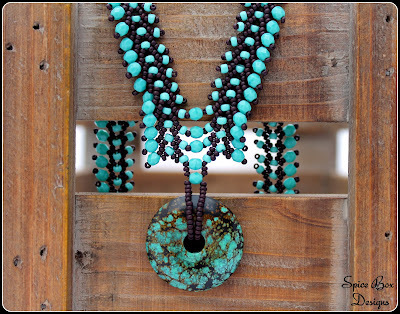 I like the use of the round turquoise color beads instead of all seed beads too! I hope the creative process put your thoughts in a little better place at least while it was being made. Love the second helping you received too!! Wow, love what you made. The necklace is beautiful. Super cool. Necklace is lovely. First, I am so sorry that is is a time of sadness for you but the necklace is absolutely beautiful. And, what wonderful gifts of the finished jewelry. 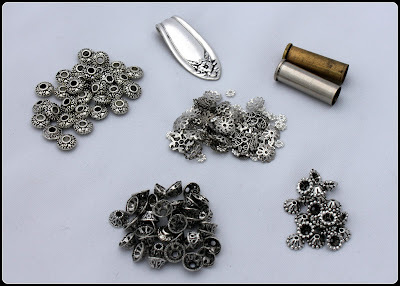 Your second helping is also a gorgeous piece of jewelry just waiting for your gifted hands to put it together. Thank goodness for beads and their ability to help pull us up when we need it. Hugs to you, it's a beautiful piece and I look forward to seeing what you do with your second helping as well :) Anyone who can create beauty out of grief is pretty special in my book. My heart goes out to you on the loss of your daughter. I am struggling with some of the same issues as my husband passed away on August 11 last year which is my reveal date this year. I think you did a great job and hopefully the piece you made was a way for you to work with your grief. Beautifully woven. I'm so glad you could have a tiny bit of distraction during this difficult time. Hugs. Lucky you to receive two helpings of soup! Love the necklace that you made, great job! Oh gosh I am SO SORRY! I wish you'd let me change you -- what a loss. But your jewelry IS beautiful, as are you. Beautiful piece. The colors u chose for the seed beads brought out the colors of the focal. I am sorry for your lost and that this being a difficult period. Take care. I can't fathom your loss. I'm very sorry. I think you made a lovely necklace and it's so sweet that you got a second helping too. Can't wait to see what becomes of it. I am so sorry that this was a hard time for you, but you'd never know that by the wonderfully beautiful necklace you made! When I see such lovely beading as this, makes me want to try it sometime. Everyone who knows me, knows I don't need another hobby! What a beautiful, balanced piece, just gorgeous! You are too hard on yourself. It is a beautiful piece. It inspires me to want to learn more beadweaving. I am sorry about your daughter. I think the beadweaving on this is just stunning! I'm a stringer, not a weaver so I'm amazed at this - I think it's incredible! I think the necklace is beautiful. Although this month was so difficult for you, I think you were matched up with the perfect partner. So sorry for the loss of your precious little one. Lovely piece! And serendipitously you have more soup and more time to play! What a beautiful necklace, even though you say you are not completely happy with it. Looks perfect to me. Warmest hugs to you, I am sad about your loss. Coming back to see what else you make. Take care. I am so sorry that this is such a hard month for you. I don't consider the necklace that you made to be playing it safe. It is absolutely gorgeous. While you are not happy with this necklace, I think it is AMAZING!! It's really some fine work and you should be proud. Though, I do understand you felt rushed and June is tough for you. I'm not sure what to say to convey my condolences and sympathy for your daughter, but I do send hugs and best wishes for your heart to heal. I really like your "safe" piece and also like what Kim sent you. Marla, I am so sorry for your loss and how hard this month must be for you. I do know how tragic this is as my daughter lost her boyfriend 2 weeks ago. I felt the same as I was doing my bead soup reveal but made it through. You did an amazing job - the necklace is beautiful. I have so much admiration for you beadweavers as I just don't have the patience for it! 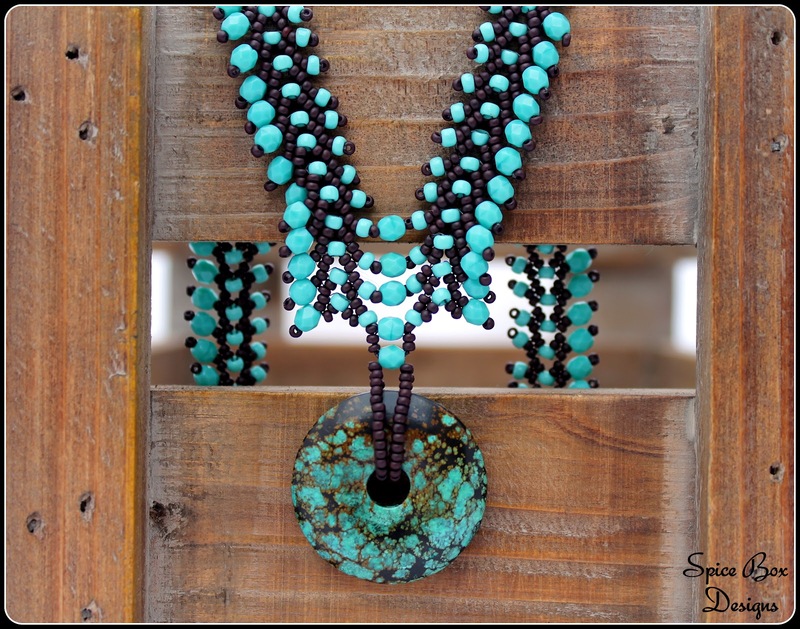 Gorgeous piece, love how the turquoise is set off by the darker beads, just striking! Maria, So sorry to hear what you are going through...one of the hardest. I think your piece is lovely...you really have me looking forward to the next soup. I think the piece is perfect..
You did an awesome job despite a difficult time for you. I love the design very much... beautiful! What a wonderful soup you received!...and a great job of working with it! 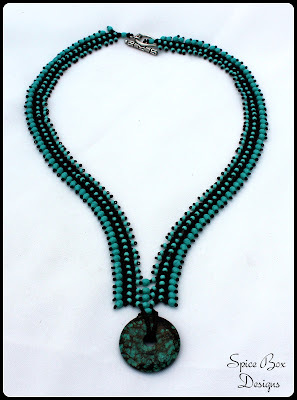 It's such a pleasure to see another beadweaver in the mix here. Very nicely done! Your beadwork in that piece is amazing. I think you did a great job. And the jewellry they sent you is so pretty. That second soup is gorgeous, too. I love those colors and can't wait to see what you do with them. sorry this was a difficult time for you. you made a lovely necklace! you have to be satisfied, it's beautiful! I'm very sad for your story... hugs!